Whether you are planning a feast at your home or bringing a dish to someone else’s home, read on for tips and recipe ideas for a healthier thanksgiving. 1. Don’t starve yourself before your feast. You will be overly hungry and eat way too much and then feel terrible. Eat something light and healthy prior. 2. Make sure you exercise. Just going for a walk can help burn some of the extra calories you indulge in and may make you feel less sluggish. You can make exercise a fun family activity too…. in my family we do the turkey trot, a five mile run in downtown Cleveland every thanksgiving we are together. 3. Watch your portion sizes. You don’t need to eat as much as possible. Leftover turkey and pumpkin pie can be frozen. 4. Replace high fat high calorie items in recipes with reduced or nonfat lower calorie items when possible. For example, using reduced fat cheese in your macaroni and cheese recipe can help decrease the fat and calorie content. Applesauce can also be a replacement for some or all of the butter in some baked goods recipes. If it is your first time trying applesauce as a substitute, and the recipe calls for 1 cup of butter I would use half the butter (1/2 cup) and replace the other 1/2 cup of butter with a half a cup of applesauce. 5. Don’t continue to sit by food when you are done eating. Move yourself away from the food or clear the table so you don’t keep mindlessly eating. 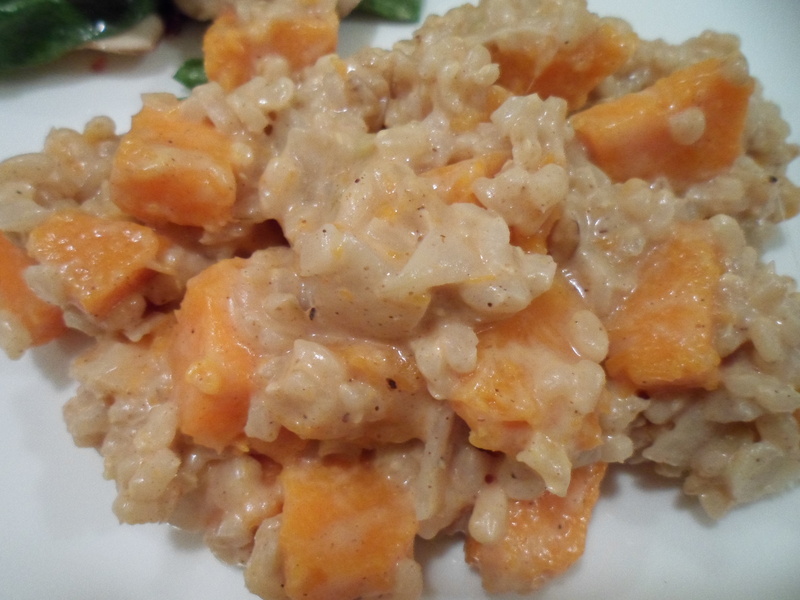 Risotto is traditionally made with Arborio rice, which is a short grain white rice. Unfortunately, it is not a whole grain so it contains less dietary fiber and essential vitamins and minerals than brown rice. Whole grains have been linked to a lower risk of cardiovascular disease, diabetes, and some cancers as well as healthier body weights so I am always trying to sub in whole grains in recipes whenever possible. I love risotto… so I had a goal to try and make it with brown rice. I scoured the internet for recipes for whole grain risotto and found very little so I tried making it the traditional way and just replaced the Arborio rice for short grain brown rice and used white wine and unsalted vegetable broth for the liquid. It took forever. I kept adding more and more and more vegetable broth and stirring and stirring and stirring and eventually after an hour gave up and ate it because I was starving and we had to be somewhere. I felt like I was on “Top Chef” with a recipe that was not working and running out of time. 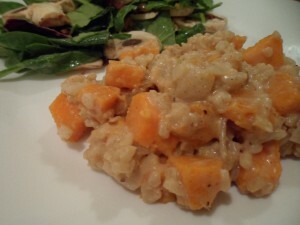 While the flavor wasn’t bad, my risotto tasted under cooked and was a little crunchy. It definitely was not worth the effort and I would have been eliminated had I been on “Top Chef.”. So I thought about what I could do to make a whole grain risotto work. I thought that maybe if I cook the rice about half way first, it wouldn’t take as long and wouldn’t end up crunchy. I also decided to use some coconut almond milk instead of broth to help give it a little more creaminess and a different flavor. I’m so glad I tried to make a whole grain risotto a second time because it turned out great and I couldn’t even tell it was with brown rice when I was eating it! I wanted to make a healthy pumpkin dip for Halloween so I mixed pumpkin puree with nonfat vanilla yogurt, some neufchatal cheese and spices. That’s pretty much it… super easy. As for the dippers I attempted to make apple chips but apparently they stick to wax paper when in the oven  (I learned the hard way that parchment paper should be used instead). So after my sad attempt at apple chips I just cut up my remaining apples into slices and just used them as dippers. To prevent browning I soaked them for a few minutes in a solution containing 2 tablespoons of lemon juice and 2 cups of water. The dip turned out super delish and everyone seemed to really enjoy it! This would be a great addition for Thanksgiving dinner in a few weeks! Mix all ingredients together using either a food processor or a hand mixer. Cover and keep refrigerated until ready to serve. Pair with healthy dippers such as apple slices.